Nuclear chemistry comprises isotope chemistry, radiochemistry, radiation chemistry and nuclear reaction chemistry, along with applications. These interrelated fields are all covered in this textbook for chemists and chemical engineers. This new edition of the standard work 'Nuclear Chemistry' has been completely rewritten and restructured to suit teaching and learning needs in a wide range of chemistry courses, such as basic courses in radiochemistry, or more advanced nuclear chemistry courses. 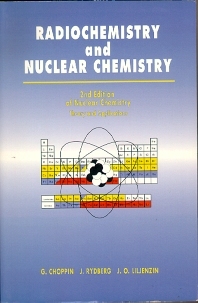 "Revision (2nd edition) makes this test suitable for both radiochemistry and nuclear chemistry courses. Well organized and well written. Excellent choice of topics."